Web.StupidProxy.com is a smart and intelligent Free web-based proxy. It allows you to remain anonymous whilst using the internet. By using ours "stupid" web proxy you will also be protecing your computer because when you surf anonymously people cannot find out your IP address and attempt to hack you. 1 What is the Proxy Server? 2 What’s the Web Proxy? 3 Why and How to use the web proxy? 4 Are Web Proxy secure to use? 5 Why are Web Proxies so slow? 6 How to set up your own web proxy? 7 Different between Public IP:Port Proxy and Web Proxy? What is the Proxy Server? A Proxy is a server that acts as mediator between the computer of a user and terminal server,The terminal server is the hosted on the other ends of network connection on which the information requested by the user appears.Such as, When you want to use proxies for google search to protect your privacy,the server of google.com just the terminal server. When clients request data from an Internet resource, traffic goes from your web browser / application first through the proxy server before it reaches the requested sources and back through the proxy. The proxy will transmit the data (information) to you. A web proxy is a web server that allows you to surf the Internet without exposing your IP address to the outside world. You may be wondering what harm it could do, if others knew your IP address. True enough, it usually will not matter. However, there can be a problem if a hacker comes across your IP. Computer hackers are always scouring the Internet, looking for unprotected IP addresses. Once they find one, they will always try to hack into it, often with malicious intent. Proxy servers can act as deterrents to their activities. All proxy servers usually work in a similar process. First, you have to visit the home page of the proxy server website and type the URL of the website you want to surf in the search box of the proxy. If the URL is a valid one, then the proxy server will fetch the corresponding webpage and display it. After that, you can surf the website in the same way as you would without the proxy. The process may take a little more time than usual on the first time you access the website. PHProxy, Zelune, Glype, PHPWebProxy, CGIProxy and Sffix Proxy. The websites just as proxy server, so you can easily unblock Youtube, Gmail, FaceBook or twitter when surfing from school or work.The web proxy allows you to surf the internet and view websites that may have been blocked by your school or work by mistake, and also gets around blocks imposed by location filtering in certain countries. StupidProxy.com offers a fast, easy to use proxy site that caters to this. With multiple ways to get to the site it is ever blocked, ways to hide yourself, support for YouTube Videos, and more. Important Upadate: I've removed the function on watching YT Video(sorry for that) for too many data requests on my VPS,I do not want to put advertising to cover the VPS cost.The other stuff is 100% working, if you can watch the video on those web proxy sites. Why and How to use the web proxy? Web proxy is the proxy that are used to bypass web filters or in other cases can also be used to surf the web anonymously from the server you’re visiting. Think about when you’re in school or workplace, lots of website such as Youtube and instagram are blocked by the administrator of network. Web proxy is really easy to use. You just neeed to visit the front page of the desired proxy such as web.stupidproxy.com. You will see a small bar in the center where you need to enter the address you want to visit. Once you do CLICK the “surf” or “Enter” you can get the data from the server of the URL that’s you entered. Are Web Proxy secure to use? For the most part most Web Proxy are secure. If you are looking to simply go on youtube for video or wikipedia for information the web proxies are good for you. Also now more and more web proxies support SSL protocol. That is when you can put a "s" after the "https". For example " https://web.stupidproxy.com/" as opposed to " http://". Obviously Its always a good idea to see if the proxy you use supports that. And, If you want to do things such as banking or login to the social network. You banking and social accounts are really sensitive, So i don't suggest you use the web proxy for that, If you want to use it. i suggest you should use Private Proxy or VPN Service for that. Why are Web Proxies so slow? It all really depends on where the web proxies are hosting and how to manage the proxy. Sometimes proxy owners use "shared hosting", Most often the "slow" proxies are on shared hosting where the server is shared with other website owners. They all get a small amount of resources they can each use. If the server happens to have a lot of customers and a lot of busy web pages that is more than likely why the page loads slow. Sometimes other owners decide to setup theirs on a VPS – Virtual Private Server or Dedicated Cloud Server, The Proxies hosting on VPS or Dedicated Server are stable and fast, but the webmaster may limit the download speed and file size of proxy. My Stupid Proxy is also set the limit. How to set up your own web proxy? 1.Get a web hosting or a VPS or a dedicated server. Web hosting is the most cheap but lots of hosting can’t support the proxy, you should pay attention to it. And the dedicated server is so expensive that’s cost more than $200/month. So the best choice is use a VPS to step you web proxy, and I recommend you use the best value of VPS providers to you. Linode.com – Simple, Powerful and Reliable VPS Providers. 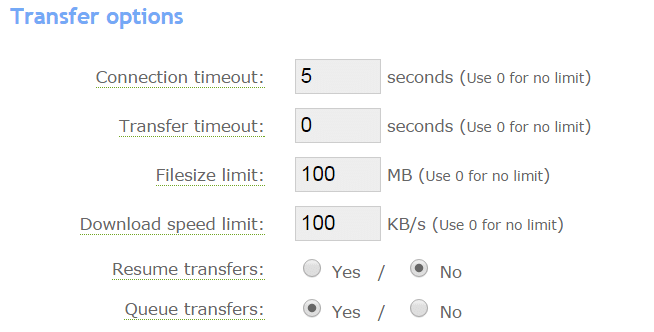 2TB Transfer on Linode 2048 cost $10/ month. Vultr.com (Now Free to Offer $20!) – 1024MB Memory, 2000GB Bandwidth on 20 GB SSD cost $10/ month. (If you’re use the web hosting just ignore this step).Though lots of web proxy code don’t need MySQL, but it’s more easy to step the VPS use the software stack . There are lots of tutorials about how to step the LEMP software stack, you can easily check this, “How To Install Linux, Nginx, MySQL, PHP (LEMP) stack On CentOS 7“. 3. Upload the proxy code( such as Glype) to your hosting or server. It’s easy to upload the code file to you hosting or VPS. If you’re use hosting you need to add a domain then upload the proxy file to the directory of domain of proxy. Also if you’re want to use a domain for the proxy, You should add Virtual Hosts first, after added the domain to your Virtual Hosts, just upload the file using WinSCP (down load from here). Then check http://server_domain_name. After this step, your own web proxy is actived! Different between Public IP:Port Proxy and Web Proxy? As you’re already know that’s web proxy is just a website that’s can only use it on web page, So here i maily tell you what’s the IP:Port Proxy, when you know that’s the IP:Port Proxy you should know the Differents. Public IP:Port Proxies are also named as public proxy servers or public proxy lists. Usually you can find lots of public free IP:Port Proxy online. The IP:Port proxy can use it on browser, such as chrome, firefox, IE and other. Also, Lots of SEO tools and Social marketing tools support the HTTP protocol to run multithreading for their task. Elite proxies. This type of HTTP proxies do not change request fields and The request is just same as the real visitor. So your real IP is hidden by the ip address of proxy server. The administrator of the web server can’t detect your real IP address. Anonymous proxies. This type of http proxies are also hide your real IP address but change the request fields,That’s simple to detect you’re using the proxy when analyze your log. The log of header information will let the web server know you’re using proxy but it’s only contain IP address of proxy server. Nothing really matters, but some server administrators may restrict the proxy requests. Transparent proxies. This type of Proxies not anonymous,The log of header information not only let the web server know you’re using proxy but also they transfer the real IP. It’s can not be use it anonymous surfing on the internet. People use the transparent proxies for cache the data that’s good for network speed improvement. There are 2 types of SOCKS Proxies, Socks 4 and Socks 5. The Socks 5 is the best secure proxy protocols, When you use the socks proxy, All your traffic is encrypted so no one can see what your doing. Its a tactic often used by people at hacker conventions to stop them from sniffing what your doing on the Internet. For SOCKS Proxy is relays on TCP sessions , So, The web server can’t get only information about the users. All of SOCKS Proxies are Elite proxies, the web server only get the information of proxy server.That’s why SOCKS 5 proxy is more Recommend. 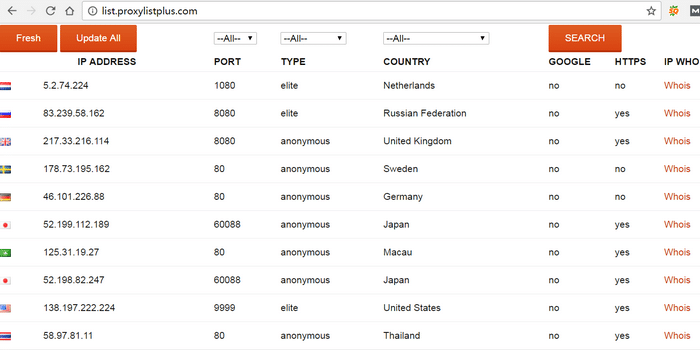 And it’s really not easy to find a fast public socks proxies online. So, If you’re want to set up a SOCKS proxy you need a shell account, you can use an ssh connection to a VPS or Dedicated server if you have that, And you need to do a bit of setting up. Once its done you can run your Browser, MSN/Yahoo/AIM messenger, Torrent Application, and many other programs though it seamlessly, and you don't even realize that your using a socks proxy. 2017-2018 StupidProxy.com All right reserved.